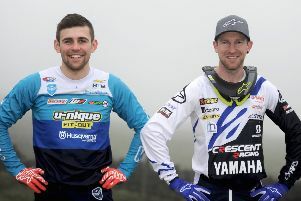 With just two weeks to go until the HTM Off Road EnduroCross returns to Glenarm and The Dalriada Festival, organisers say preparations are well under way to make the illustrious event bigger and better than ever before. A SuperVET class has been added to the race schedule following substantial interest on social media and MTA Process Components have been confirmed as the new class sponsor. MTA join headline sponsor HTM Off Road as an event partner and this valued input will be going towards the awards fund. A spokesman for organisers, Carrickfergus and District Motorcycle Club, said: “Those following social media updates will have seen that there will be a number of positive changes to the circuit layout for 2015, geared to encourage more entries from clubman riders. “Plans are ongoing to create separate sections of track for the expert and clubman classes and when these are implemented, it can only make for closer and more exciting races. “One obstacle that certainly made for some spectacular action shots in 2013 was the Water Splash and the club can confirm its return is planned for this year’s event. Entries have been coming in steadily for the event and with the closing date not too far away, riders should head over to www.carrickfergusmcc.co.uk to ensure they book their place on the grid before entries fill.